I’ve been working on this one for awhile and I’m really excited to finally see how you all like it!! 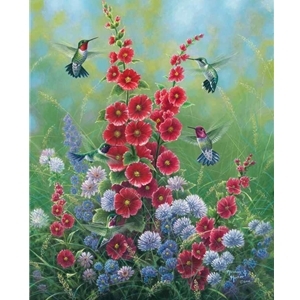 It has a Ruby-throat, Anna’s, Calliope, and Black-chinned hummingbird, and then I added one lovely lady hummingbird! I went to Kroger and bought a bunch of different flowers to combine for reference. I really tried to capture the buzzing, high energy of these dazzling birds and the life and color of summer! I hope you all like it!